The primary focus of this page is on procedures when everyone involved is in agreement and cooperating. It does not include information or forms for litigating a probate case. If you need help with a family estate we have the expertise and certification in this field. I you just are getting starting with the probate process or are 90 days in. We’re here to guide you. Are main focus is the sale and liquidation of the real estate assets in probate. Keeping your family safe and free of debt collectors and added stress after passing on is of utmost concern. Hiring a Certified Probate Real Estate Specialist is a good way to avoid unforeseen headaches. 12 most common mistakes an administrator or executor can make during probate and how to avoid them. What follows below is a list of common mistakes that can be costly if not voided. We encourage you to read thoroughly. It has helped many executors and administrators alike and we hope it can assist you as well. Beginning with the end in mind provides clarity and focus throughout the entire probate process. Although it can be an overwhelming experience (especially if the decedent is your close relative), it does not have to be stressful, if you have a clear reminder of and commitment to what the end goal is. Here are some examples: peace of mind, pay off debt and taxes a.s.a.p., settle with heirs, and maximize value of estate, just “be done with it and get it over” and others. Whatever the end goal is, it must be agreed upon by all so that you get support and have confidence in the decisions you make as the executor/administrator. You can educate yourself on our site about the process and read the timelines and/or go to your local courthouse to get more information. Once informed, it does make a lot of sense to talk to an attorney about the process and see what he/she thinks might be appropriate in your situation. You may then decide that you can handle this “pro per” meaning without a lawyer and represent the estate yourself as you go through the probate process. You might decide to use an attorney because your case might be slightly complicated or the estate is not in your hometown or state or you simple have no time on your hands. Your probate attorney is an expert in his field and will be paid as such. If you rely on your attorney for expertise such as taxes, securing the real estate, selling real estate, maintaining property, etc. you are not fully using local talent and maximizing the value of the estate. Financial planners, CPA’s, local realtors, contractors and estate planning firms are experts in their perspective field and can give you specialized knowledge which pays off in both the short run and long term. Do not make the mistake of waiting too long to market any real estate, if you’d like to settle the estate as quickly as possible. Once you have been approved as the executor of the estate, you can begin soliciting offers on the real estate. In other words, parallel to handling everything else, you can list with a realtor, get advice, solicit offers and even go into escrow. Escrow will not close until you have acquired letters testamentary / letters of administration. As long as your buyers are aware of this, you will do fine. 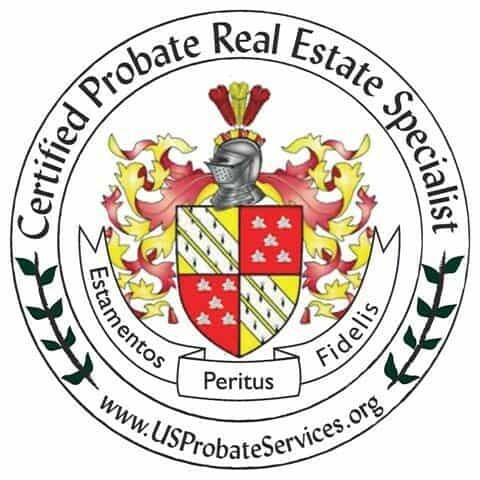 Be sure to use a realtor that understands probate. Now that you are responsible for the real estate that means you must make sure it is secured and properly maintained. If you are not in the same city or state this can become a challenge for you, especially if curb appeal suffers and squatters take over. A good realtor that understands your probate needs can also help you maintain the property by using people in his/her network. Now that you might need an attorney, realtor, tax advisors, financial planning and estate planning, you can find yourself surrounded by well meaning friends that want to help. E.g. you might have an attorney friend that practices business litigation that will help you with probate. This is where you must be cautious and make sure you pick your team of professional experts that will get the job done because this is all they do. Similarly, you might have a realtor friend that specializes in a certain area of town or other type of real estate that wants to list the real estate for you. 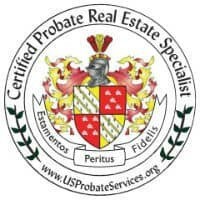 Again, having a realtor with probate experience that specializes in the area of your real estate location will benefit you and ensure you get the most out of it. 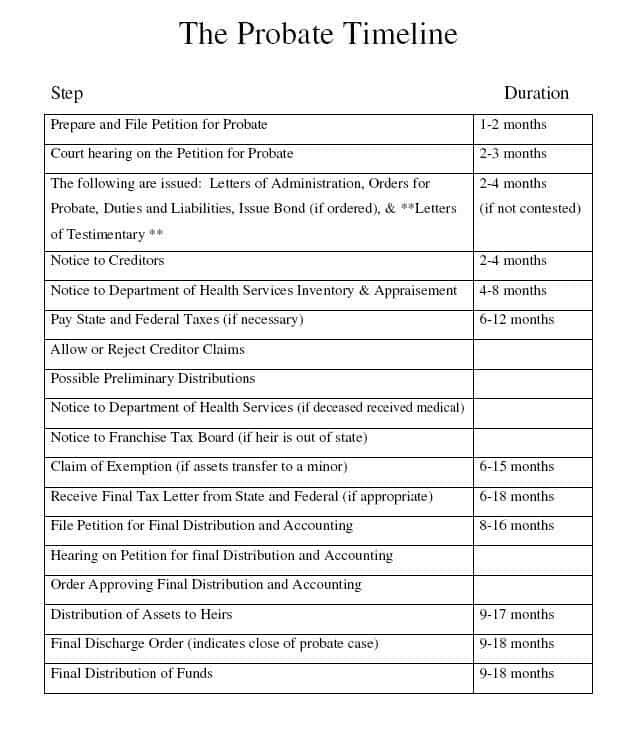 Below you will find a diagram of the probate timeline that mentions documents and actions taken. Depending upon your locality and process it may vary just a little. It’d be a shame to get to the very end of the process and realize you can’t settle because one document is missing. Waiting too long to begin the probate process. As time goes by taxes add up, creditors become pushier and heirs more impatient. Losing a loved one is devastating and moving forward can at times almost seem emotionally impossible. However, waiting too long will add pressure and demands from others to your mourning process. Give yourself time to mourn but also realize that the longer you wait the greater the demands. If you are not comfortable with or not used to accounting and balance sheets, it make sense to enroll a professional such as a book keeper or CPA to help you. At the time of settling the estate all numbers must align and make sense. If not, you might get objections from the heirs or maybe even a judge. In many cases where records were not properly kept, the probate process lasted up to 24 months when it should have taken half that time or less. This is a simple one. As soon as you can, ask that the post office forwards all mail to an address or PO Box that you have access to. The reason being, that you may miss out on important notices and claims from creditors and/or lenders. Another good reason is that you do not want the property to be too inviting for burglars or vandalism. When mail piles up, it is a sure sign that the property is vacant. This goes back to the initial mistake “No outcome in mind” when you begin the process. At the outset of probate it is crucial that all heirs are on the same page and agree that you handle the estate. Along the way you may have smaller setbacks and it will not go as planned. Make sure you communicate every setback and progress. If an heir counts on his/her inheritance by a certain date based on the agreed upon goal you all set, then any delays will greatly impact the heirs life. Real Estate is the biggest component of the estate’s assets. Depending upon your desired outcome and goals you should know that you have options in real estate. The basic and straight forward approach is to list with a local realtor. You may also find yourself with real estate that needs some work and could therefore fetch a greater price after some repairs. If you do not have the cash for the repairs, but ample time on your hands, there are people we can refer you to that will gladly partner with you on the repairs. Finally, if you are in a rush, don’t have cash to fix up the real estate and just want to get done with it; an investor will pay cash for it. Knowing your options gives you flexibility which gives you power in your decision. the estate has assets (other than land, and not including cars) whose net worth is more than $100,000. distributing remaining proceeds to the heirs. The personal representative may also bring court claims on behalf of the estate. no application for appointment of personal representative has been filed. If there is any question about who the decedent’s successor is, then a third party might ask for the court appointment of a personal representative before distributing the asset. Utah Code 75-3-1201. Informal probate is the process for asking the court to appoint a personal representative for a decedent’s estate without a hearing. This process is usually used when all interested parties agree about who should be appointed personal representative and how the estate should be distributed. Formal probate is the process for asking the court to appoint a personal representative with a hearing, usually because there is some disagreement about who should be the personal representative or how the estate should be administered and the interested parties need to the court to make decisions. This web page covers only the informal probate process, when all parties are in agreement and cooperating. Nominated in the will to be a personal representative. Spouse of the person who died if the will makes a gift to the spouse. Any person receiving a gift under the will. Spouse of the person who died even if no gift is made to the spouse in the will, or if there is no will. Any heir of the person who died. Any creditor of the person who died, if 45 days have passed since the death. Settling the remainder of the estate in accordance with the will or the law; submitting a final accounting. The person who is appointed personal representative is responsible for distributing the estate according to the will and according to the law. An informal probate case may not be filed with the court until 120 hours (five days) have passed since the decedent’s death. Utah Code 75-3-307. The case must be filed within three years of the date of the decedent’s death. If it has been more than three years since the decedent’s death, parties will need to follow a different process for a determination of heirs, and should contact a probate attorney for help. 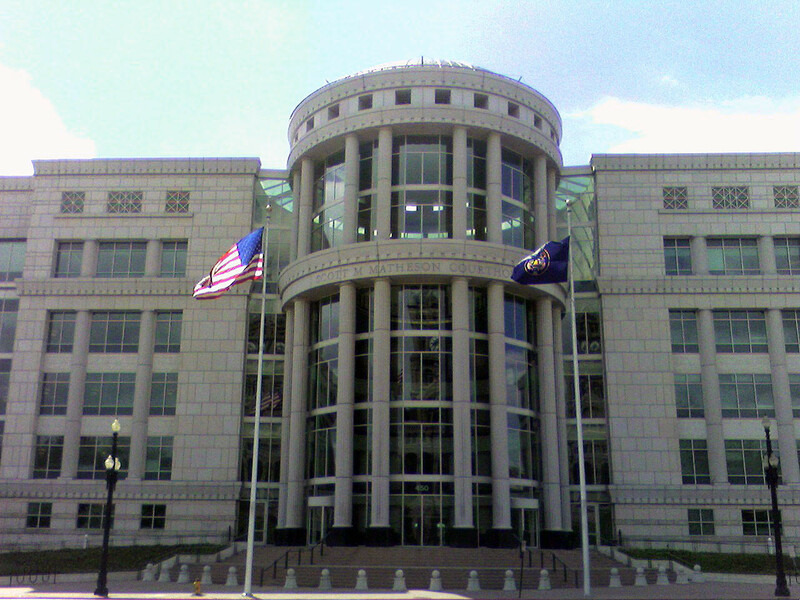 Utah Code 75-3-107. A probate case can be filed in Utah if the decedent resided in Utah at the time of their death, or if they owned property in Utah. A probate case may be filed in the district court of the county where the decedent lived at the time of death, or in the district court of the county where the decedent owned property. 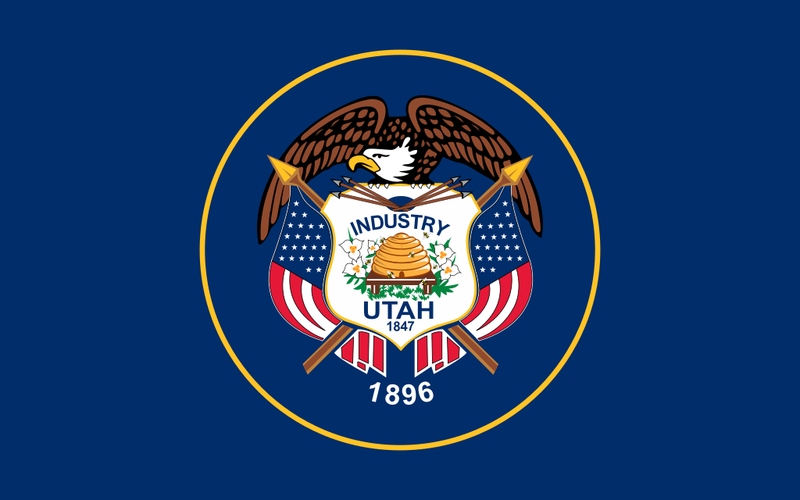 Utah Code 75-3-201. If the decedent left a will, the will may nominate someone to act as personal representative and list the decedent’s wishes for how the estate should be distributed. If there is a will, the original will must be filed with the court along with the other paperwork to start the probate case. When a person dies without leaving a will (known as “intestacy”), Utah law describes who will inherit according to intestate succession. See Utah Code 75-2-101 et seq. for more information about intestate succession. The following documents are needed to open an informal probate case. If you need to litigate or close a probate case, consult a probate attorney for help. To start an informal probate case, the person asking to be appointed the personal representative files an Application with the court along with the filing fee and a civil cover sheet. any others having a property right in or claim against the estate of the decedent. 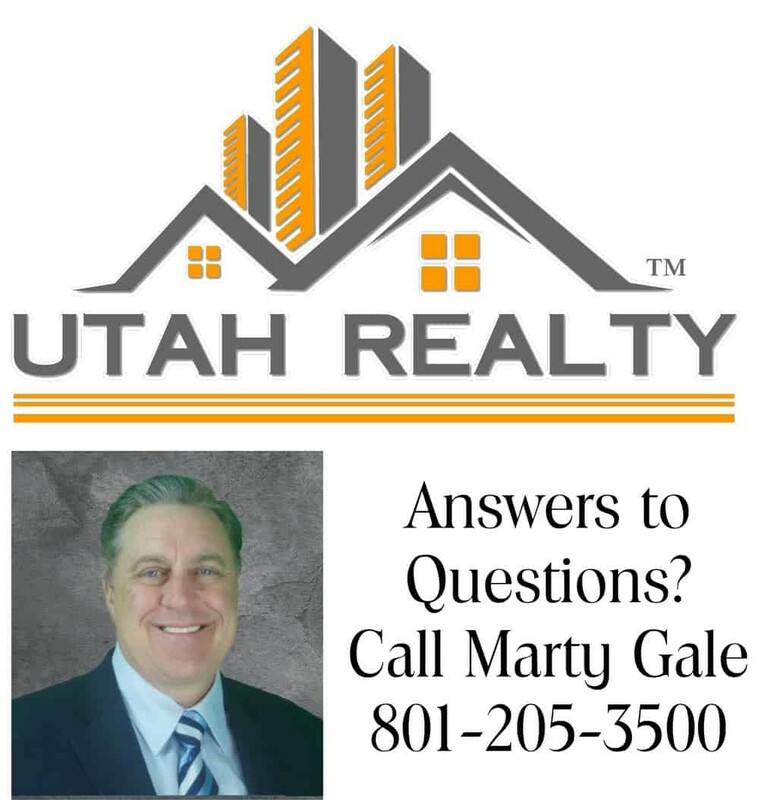 See Utah Code Section 75-1-201 for a full list of “interested persons.” If an interested person will not sign a Waiver of Notice form, then a hearing will need to be scheduled and that person will need to be sent notice of the hearing. This changes the probate from informal to formal. The formal probate process is beyond the scope of this page. In some circumstances, notice of the application is sent by the court to all interested persons listed in the application and if no interested person files an objection to the application, the court can appoint the personal representative without a hearing. Utah Code 75-3-306. Check with the court where the case is filed for local practice information. Utah law defines who has priority to be appointed personal representative. Someone with equal or higher priority than the applicant can agree to the applicant being appointed personal representative by signing a Renunciation form. See Utah Code 75-3-203. The applicant must also submit an official death certificate with the probate paperwork. Information about ordering a death certificate is available on the Utah Vital Records and Statistics website. If the decedent did not die in Utah, use the National Center for Health Statistics Where to Write for Vital Records page to find contact information for other U.S. states and territories. serve as the personal representative of the estate. perform the duties the law requires. submit personally to the jurisdiction of this court in any proceeding relating to the estate that may be filed by any interested person. The Statement of Informal Probate is the document the court uses to approve the appointment of the applicant as the personal representative of the estate. If the request is approved, the court signs the document called Letters Testamentary (if there is a will) or Letters of Administration (if there is no will). A certified copy of this document can be presented to third parties – such as banks and insurance companies – to show that the named person has been appointed by the court as personal representative of the decedent’s estate. Any person who does not agree with having the applicant named as personal representative, or who does not believe the estate should be informally probated, may file with the court an Objection to Appointment of Personal Representative form. If this is filed, the court will schedule a hearing. This changes the probate from informal to formal. The formal probate process is beyond the scope of this page. Once everything has been filed with the court, the court will decide whether to appoint the applicant personal representative and sign the letters. If the court does appoint a personal representative, the person appointed personal representative should get at least one certified copy of the Letters of Administration (no will) or Letters Testamentary (will) to present to third parties, such as banks, insurance companies, etc. Ask the clerk’s office for certified copies. Once the personal representative has been appointed, they can then publish notice to creditors. It is not required to publish notice to creditors; however, the personal representative may wish to do so if they do not know about all of the decedent’s debts. See Utah Code 75-3-801 for more information.